Pictured: RB-BCL. 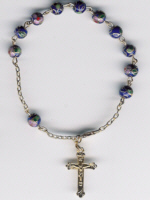 Blue 6mm cloisonné beads, made with gold filled findings and a gold filled crucifix. . If you want a Miraculous medal on this bracelet go to M-GF and order. 7” bracelet unless otherwise requested.